She looked at me for a moment before answering my question. “You cannot keep your hope on all time because you stay at the same place. I can, because I travel around the world and meet people who tirelessly and passionately save animals and nature under difficult situation.” I am sure she does not suggest me to follow her steps in order to keep my hope always on. I believe, giving me a special time to discuss my project with her is her way to stop me from giving up. And, it works. For a woman in her age (80), Jane Goodall is very energetic and healthy. 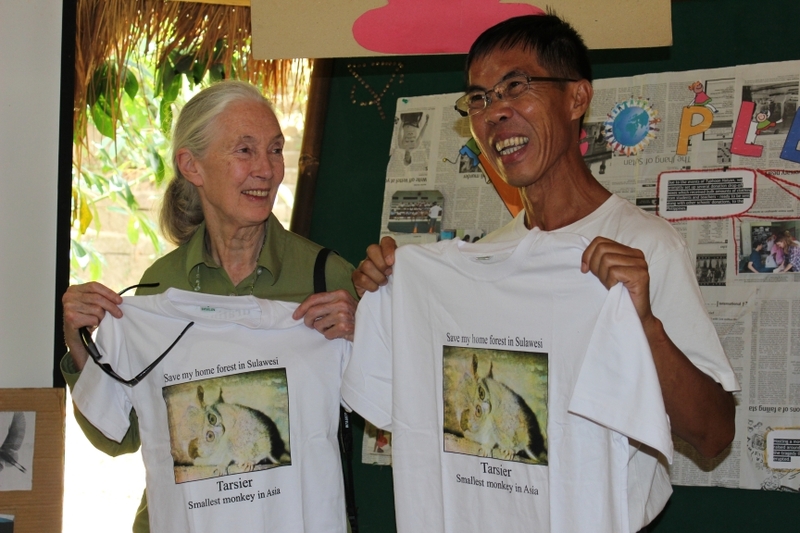 She travels more than a half year per year, meeting people, giving speech, and raising fund for Jane Goodall Institute. That evening she looked tired before our meeting started but she was focused on the discussion afterward. Her speech is always clear and systematic, sprinkled it with scientific terms and funny remarks in proper dose. She could have retired peacefully, but she decides to keep saving the animals and nature while still be able to do so. At the end of meeting, Jane said, “Let me give you a chimpanzee hug.” I was confused. We hugged and Jane voiced ‘shush, shush, shush’ near my right ear, imitating chimpanzee’s expression. She is a serious but hilarious lady. And, she definitely has boosted my determination to continue my conservation struggle.